The distributed management group installation will form the foundation of 99 percent of Operations Manager deployments. It allows for the distribution of features and services across multiple servers to allow for scalability. It can include all Operations Manager server roles and supports the monitoring of devices across trust boundaries through the use of the gateway server. The following diagram presents one possible option for the distributed management group topology. There is no direct communication between an operations console and the databases. All communication goes to the resource pool through TCP 5724, and then to the database servers using OLE DB on TCP 1433 or another customized port a customer establishes. However, there is direct communication between an Application Diagnostics console (residing with a web console) and databases. Single management group configurations do not support partitioning. Partitioning is the separation of management group services across multiple management groups. In Operations Manager, you may want to create multiple management groups for the following reasons. Operations Manager management groups support only one installed language. If the overall IT environment that you need to monitor has more than one installed language, a separate management group will be needed per language. Even the largest distributed management group implementation will not be appropriate in every instance. This will lead you to implement multiple management groups, which will split your monitoring and alerting data between management groups. To provide a single, consolidated view of your environment, data from multiple management groups can be consolidated and viewed in another management group. For more information, see Connecting Management Groups in Operations Manager. You may need to have separate groups as needed according to function, such as preproduction for testing management packs and new servers, and production for monitoring daily business processes. Your company may have other administrative, security, or business needs that require complete separation of monitoring data and administrative teams, which will mandate additional management groups. Span trust boundaries between domains and workgroups. Have multiple network environments segmented by firewalls. Have a need for high availability. Must have a scalable monitoring solution. This configuration supports full distribution of features among servers in the management group as well as monitoring of devices across network boundaries, resulting in a longer list of ports that need to be available for communications. For more information, see Connecting Management Groups in Operations Manager. You deploy either System Center 2012 – Operations Manager or System Center 2012 Service Pack 1 (SP1), Operations Manager in a distributed management group when you want to allow for scalability and high availability of your management servers and gateway servers. By default, all management servers are members of the All Management Servers Resource Pool, which balances the monitoring load of your management group as new management servers are added, and provides automatic failover for monitoring. 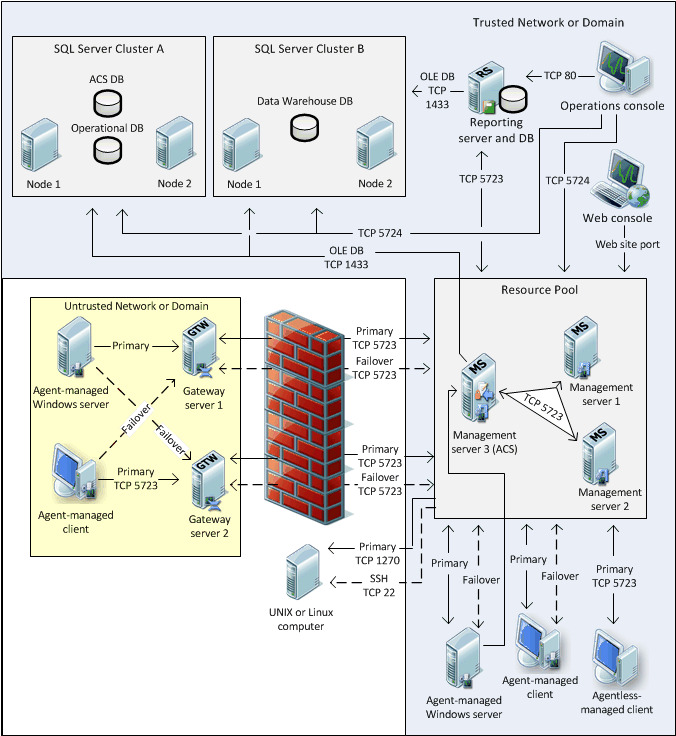 A distributed management group distributes the various features of Operations Manager across several servers. For example, you can install the operational database on one server, the web console on a second server, and the Reporting server on a separate server. This differs from the single-server management group installation, where all features are installed on one server. For more information, see Single-Server Deployment of Operations Manager. You can install a web console on a stand-alone server or on an existing management server, but you cannot install the management server feature on a server that has an existing web console. If you want to install the management server and web console on the same server, you must either install both features simultaneously, or install the management server before you install the web console.